Asbestos is a hazardous substance that causes ill-health to anyone who disturbs it and was used in household products and building materials. Fortunately, asbestos is no longer used or imported in the UK (it was banned in 1999) due to the health hazards it creates. 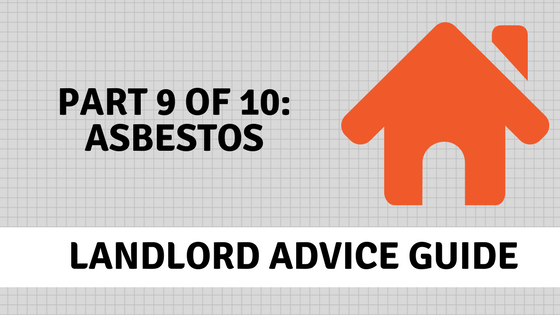 Where is Asbestos found in rental properties? The use of asbestos was particularly popular during the 1950s to 1980s, so pay particular attention if you rent out a property that was built or refurbished during this period. Asbestos was used so extensively because it possesses many idyllic properties. Amongst other things, asbestos is strong, incombustible, heat-resistant, cheap, sound absorbent and can control condensation. It could be used to make all sorts of products – from roof tiles to kitchen paper – making it easy to see why it was so popular. Textured wall and ceiling coatings, such as Artex. Asbestos insulating board in walls, ceilings and doors. Fire blankets and fire doors. Anyone who disturbs or damages an asbestos containing material, and who consequently inhales the harmful fibres, is at risk from ill-health. Tradesmen such as plumbers, carpenters, electricians and gas fitters are most at risk, as are those who take part in any other sort of building repair or refurbishment, like plasterers, roofers, decorators and heating engineers. What are Landlords’ legal responsibilities? Under the Control of Asbestos Regulations 2012 (CAR 2012), employers and the self-employed must prevent people from being exposed to asbestos or else reduce the risk to as low a level as possible. These regulations apply to landlords but the legislation is somewhat confusing, as the law only refers to ‘non-domestic’ properties. This means that you have a legal responsibility to assess the risks from asbestos in all common parts where people don’t live, such as entrance halls, stairways, shared roof-spaces, shared garages, boiler rooms and communal gardens. The law requires you to find out if asbestos is present in these communal parts and protect people from the hazards. If you locate asbestos containing materials then you should make a record of the location and type of asbestos and ensure a plan is in place to manage the risks and monitor any changes in its condition. If you intend to instruct tradesmen to work on your property then you should inform them of the presence of asbestos (or suspected presence) before they begin work. Perhaps confusingly, under CAR 2012, private residences like individual flats, private houses and private rooms etc are not covered by the same requirements and so you don’t have a ‘duty’ to manage asbestos risks. However, it’s still seen as good practice to assess the risks in order to keep your tenants from harm. The Defective Premises Act 1972 reiterates the importance of protecting tenants from personal injury or disease caused by a defect in the state of the property. Whilst asbestos isn’t specifically mentioned within this law, it makes sense to assume it is included. You should therefore do all that you can to identify the hazards and ensure they are controlled. You can find out more about Asbestos Regulations from The Asbestos Information Centre. What should you do if you suspect Asbestos is present? If you, a tenant or a tradesman suspects that asbestos may be present in the property then your first step is to leave it alone. Disturbing or trying to move the asbestos will cause harmful fibres to be released so it’s important that you don’t try and remove it yourself. Inform your local authority of your suspicions and arrange for the material to be tested and/or removed by a licensed contractor if necessary.